Sawyer "Madman" Fulton debuted on Impact Wrestling last night. 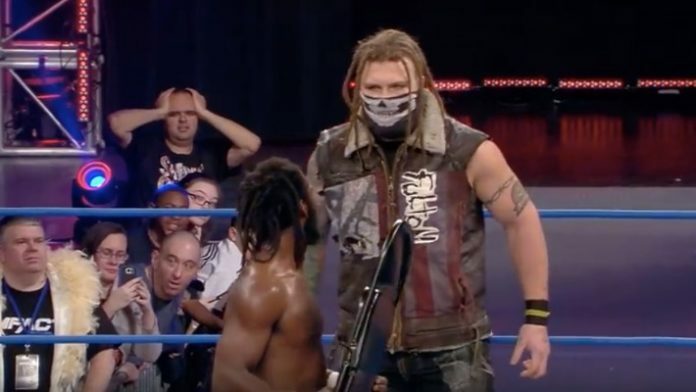 Last night on Impact Wrestling, Sawyer “Madman” Fulton became the newest member of Sami Callihan’s OVE stable. The 28-year-old from Toledo, Ohio is formerly of WWE’s Sanity stable and also competed with Callihan in MLW’s War Games match last year. Fulton is now going under the name Madman Fulton. Listed at 6ft 8 and over 300lbs, Fulton helped Callihan beatdown both X-Division champion, Rich Swann, and Willie Mack last night to close the show. Swann had just defeated Callihan in a match for the X-Division championship. Mack had previously taken out the other members of OVE in the back to prevent their interference in the night’s main event. Fulton spent nearly 5 years in WWE developmental from 2012 to 2017. He was briefly in a team with Angelo Dawkins of the Street Profits before being partnered with Alexander Wolfe in 2016. Wolfe and Fulton would then join Eric Young’s Sanity faction later that year. In late 2016, Fulton was replaced in Sanity by Killian Dain. No on-screen explanation was given for Fulton’s departure. WWE released him the following year. I told you I had a HUGE surprise. In 2018, Fulton began appearing for Major League Wrestling. He was a member of Sami Callihan’s Death Machines stable which lost at MLW: War Games in September.